Local agency, Vibe, has been working on the public relations brief for the £90m Silk Street scheme in Macclesfield. 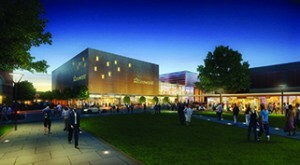 The project, which features Debenhams and Cineworld as its anchor tenants includes 19 retail units, a new public square, green spaces and a car park has received approval from Cheshire East Council. Vibe was appointed by Wilson Bowden to manage local communications, community liaison and stakeholder engagement. “With strong regeneration credentials and experience in managing major multi-stakeholder projects, we were thrilled to take on the brief. We have worked closely with the central PR team to ensure a consistent approach was applied to a highly targeted campaign of media relations activity and community engagement,” stated Natalie Nuttall, PR director at Vibe. The agency also worked on the brand concept, including naming, logo and graphics and street furniture. “Local engagement has been critical to the project. From the outset we have worked closely with residents, businesses and community organisations to take on board their comments,” explained Will Robinson, retail director at Wilson Bowden Developments. Work is due to start next year, with project completion expected by 2016.